One of my favorite things about Easter is my Grandmother’s Easter Bread. As a little girl I loved the delicious bread with the hard-boiled egg in the middle or when she braided it into the shape of a cross. It is one of those foods that instantly takes me back to childhood. As she got older my Grandmother stopped making the bread and when I was in High School I asked her for the recipe. She sent me a hand written copy of the recipe explaining each step and why she doesn’t make it anymore because the bread is very labor intensive and she was getting older. Year after year I try to make my Grandmother’s Easter Bread but it never comes out quite the way she made it. Last year it was too tough, some years not bread like enough. But every time I sit down and look at that recipe I am reminded of her and how delicious her bread was. 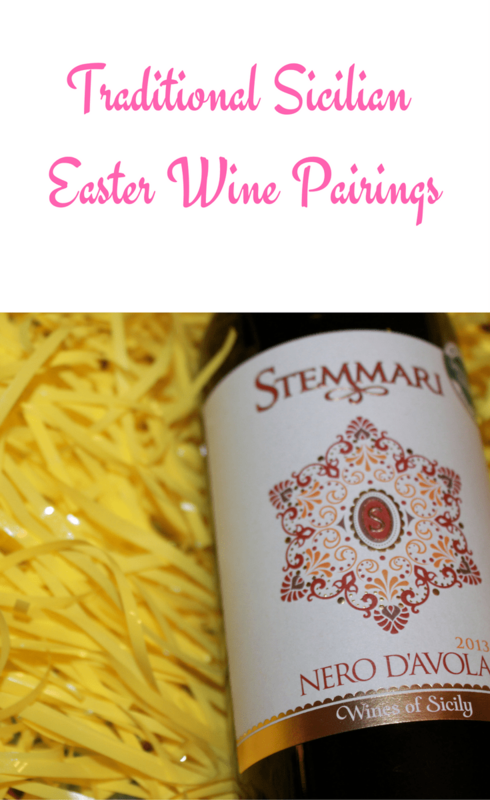 Wines of Sicilia is partnering with me to share some great traditional Sicilian Easter wine pairings, one of which includes my beloved Easter bread. Fritella is a mix of fresh peas, fava beans and artichokes. This is a popular Easter side dish, paired nicely with a bottle of Nero d’Avola wine. This side dish would definitely be something different on your Easter table, make sure to check out this recipe for Fritella. Cassata is a typical Sicilian sponge cake stuffed with sweet ricotta cheese, covered with a shell of marzipan and topped with candied fruits. This dessert sounds like a dream come true, especially for someone like me who has been known to eat ricotta straight out of the container. If you are unfamiliar with cassata, here is a great recipe, as well as many other Sicilian recipes. During Easter, this dessert can be found on tables all over the island, paired with a glass of Nero d’Avola wine. Cannileri is a decorated sweet cookie or salty bread with a boiled egg in the middle. Both versions are mainly homemade and a great Easter treat to mix with Nero d’Avola wine. This is the Easter bread that my Grandmother made every year, if you are interested in giving it a try, here is a good recipe for cannileri. These recipes are definitely different from the more traditional American Easter foods and would be a great way to switch up your holiday menu. Nero d’Avola is a dry full-bodied red wine, that pairs well not only with these dishes but pairs well with many other foods and is enjoyable all on its own. I have never had any of these foods before – but I am so intrigued! And the wine . . . that wine sounds amazing! Thank you – I feel like I just had a mini course in Italian! So glad that you learned something and hope you try some of the recipes.